No Trace is at the Farmer’s Markets! Shop in person at an upcoming farmer’s market! No Trace will be at the following farmer’s markets. Come by to shop in person! Mission St. Ext. and Western Dr.
It’s been awhile since I’ve written a blog post and thought I’d share some of what I’ve been up to the past two+ months! I’ve been getting No Trace goods out into the community and it’s been a blast! Starting No Trace and sharing my work has been such an awesome learning experience so far. I’ve met so many people who care about zero waste and have gotten to explain zero waste and all of my products to tons of other folks. It has been really fun talking with people of all ages and experiences at different events. Here are some of the highlights of the last couple of months. It’s been summer festival season here in Santa Cruz, and I’ve been to several over the past months. These have all been really fun events. I’ve been selling my pieces and also connecting with lots of great members of the community. Thanks to everyone for organizing these events and to everyone who turned out! Here’s my booth at the Jewish Cultural Festival – a day of great food, music, local vendors, and fun times! I’m thrilled to announce that No Trace is now available at each of the following farmers’ markets! Farmer’s Markets are a great place to shop zero waste or begin your zero waste journey. You can buy fresh, locally grown produce, most of it organic, and most of it completely package free! 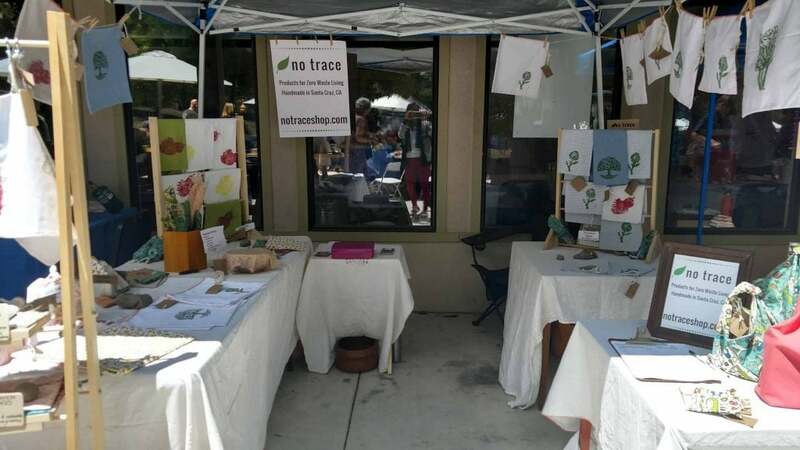 No Trace goods fit in really well at the Farmer’s Markets – lots of shoppers want sustainable food bag and wrap options. It has been great sharing my bags and wraps with so many shoppers. And I’ve loved meeting all the other vendors at the market – super nice folks! Here’s a picture of my first Farmer’s Market booth at Felton. I’ll be at each of these markets about once a month for the rest of the year. I’m so pleased to announce that No Trace is now available for sale at two new retail locations! Food Lounge in Downtown Santa Cruz! Here’s a picture of my pieces at Art Inspired of Capitola. 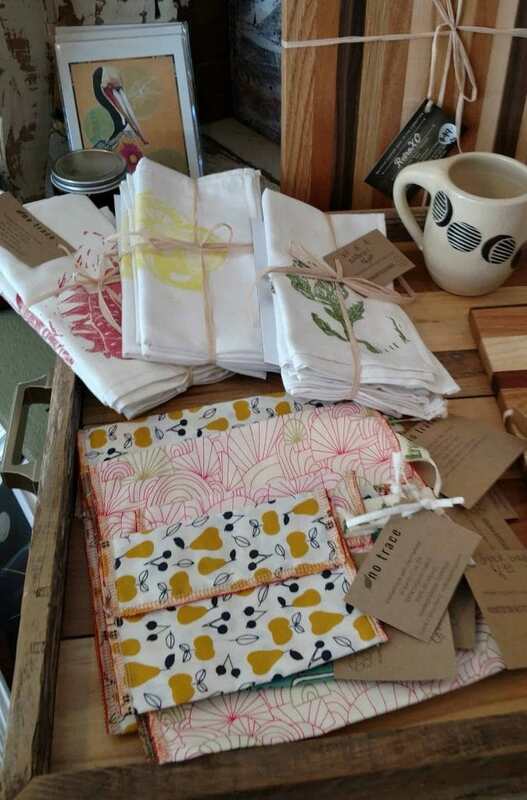 Snuggled right next to some other locally made home goods. You can also find No Trace at GreenSpace on the westside of Santa Cruz and the Homeless Garden Project near the Santa Cruz Boardwalk. I love partnering with local businesses! 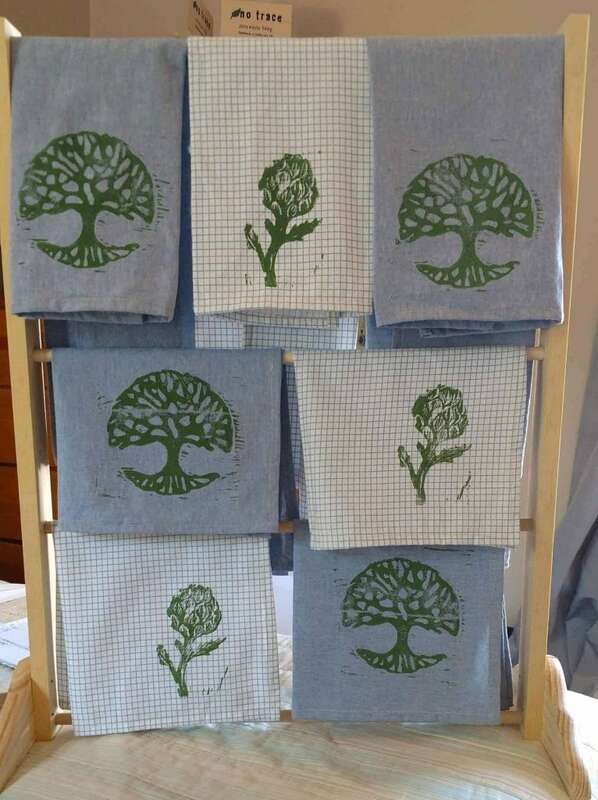 Last update – I’ve been doing a tiny bit of woodworking to find the best way to display my tea towels and napkins. I love doing a little woodworking every now and then. And this is a really handy way to show off my work :). So that’s what’s new at No Trace! Follow me on Instagram for pictures and snippets of my day-to-day (@no_trace_shop).